This set has a bright and clear neck pickup (Formally called the TTL-2 set. Same killer tone, just a new name). Great string-to-string balance with lots of beautiful overtones without the mud. 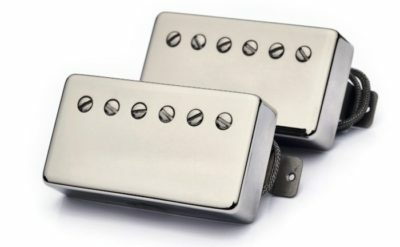 Bridge pickup has lots of complexity and openness with classic PAF bite. The bridge pickup exudes the “Tele on Steriods” that some vintage PAFs are known for – like a blackguard tele on 12. These have that legendary front-of-the-note PAF attack and bloom. Neck has roughcast ALNICO 4 magnet, bridge has roughcast ALNICO 2 magnet. Magnets are charged individually to very specific levels matching vintage PAF magnets that have been tested for killer sound, balance and dynamics. 7.3K neck and 7.6K bridge.